Remember the Win-A-Wartburg contest put on by the 24 Hours Of LeMons perpetrators, in which the winning "Why I Want A Wartburg" essayist gets a '58 Wartburg 311 and free LeMons registration? Here's the winner! 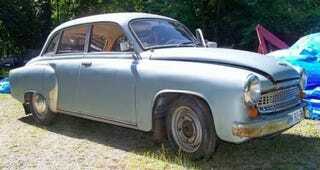 Win A &apos;58 Wartburg, Race It For Free At The 24 Hours Of LeMons! As soon the staff at LeMons HQ realized that Jim Thwaite (of Misfit Toys Racing fame) had felt it necessary to build his own widebody Yugo and has owned at least one example of every variety of Lancia Beta ever made, there wasn't much doubt about who would be dragging home one of East Germany's most advanced automobiles. Mr. Thwaite's plan is to install a Studebaker OHV six-cylinder engine- mid-mounted, of course- and then take on what he calls the Trifecta Of Crap: The 24 Hours Of LeMons, the BABE Rally, and the Grassroots Motorsports $2009 Challenge. You might also enjoy some of the the essays written by the runners-up.